Vac-Assist Suction Aspirator: Medline'S Vac-Assist Suction Aspirator Is Simple To Use And Has Rugged Construction To Withstand The Rigors Of Homecare Use. It Is Also Great For The Crash Cart. Features Convenient Electrical Storage. Weighs 12.1 Lbs. Features Include: Heavy Duty Handle Design That Prevents Breakage. Heavy Duty Vacuum Regulator. Ultra-Quiet Motor (Only 58 Decibel Operation Noise Level). Solid Base That Is Easy To Keep Clean And Features Suction Cup To Keep The Unit Stationary While In Use. Filter Is Standard. 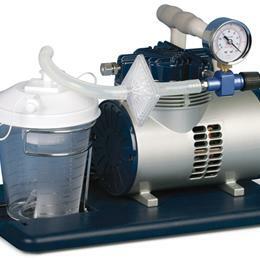 Accommodates 800Cc Or 1200Cc Canister Hydrophobic Filter, Barbed Both Ends.